The global converged infrastructure market is led by a handful of large companies, namely Dell EMC, Hewlett-Packard Company, and Nutanix Inc., finds Transparency Market Research (TMR) in a new report. These players lead the pack globally due to their best on premise data center capabilities for hybrid cloud. To maintain their foothold, strategic collaborations and mergers and acquisitions top the growth strategies of these companies. Further, hefty investments is expected to be a leading growth strategy adopted by top players in the converged infrastructure market. Key companies operating in the global converged infrastructure market include Nutanix Inc., Oracle Corporation, Hewlett-Packard Enterprise, VMware Inc., Scale Computing, Hitachi Data Systems, IBM Corporation, Cisco System Inc. Dell EMC, and NetApp Inc. 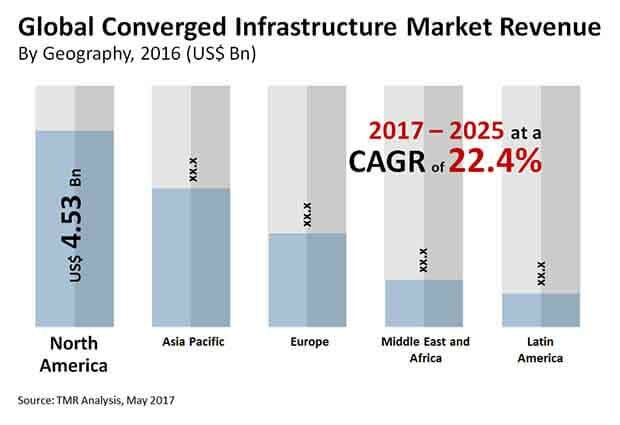 According to the TMR report, the global converged infrastructure market is predicted to rise at a whopping 22.4% CAGR between 2017 and 2025, for the market to be worth US$76.26 bn by the end of 2025. By end user, telecommunication and IT held the leading share in 2016, followed by the manufacturing segment. By the end of 2025, telecommunications and IT is predicted to hold a substantial 34.2% share of the overall market. This is because telecommunications and IT holds importance for enormous data transfer needs of network infrastructure. Furthermore, the healthcare industry is anticipated to display stunning growth over the forecast period. Geography-wise, North America holds leading position in the global converged infrastructure market. In today’s business environment, converged infrastructure model is gaining momentum. This is due to shift in business practices as organizations shift from self-owned and self-managed hardware model to a flexible self-service model. This model involves using resources on demand. Further, the model involves bundling hardware components in a converged infrastructure, rather than multiple IT assets spread across independent silos. Hardware components in a converged infrastructure is managed using management software to orchestrate and provision resources as a single integrated system. Converged infrastructure model has other advantages too. It helps reduce complexity in data center management. The facility is designed in a way to eliminate issues of hardware incompatibility. Further, ease of deployment of converged infrastructure appeals organizations. This is suitable for organizations that write cloud-native applications or host a private cloud or internal hybrid. Converged infrastructure have several advantages over traditional data center. Traditional data center requires application servers, hypervisors, backup appliances, network cards, and file storage systems to be individually configured and linked concomitantly. The design involves each component to be managed separately by a dedicated IT team. Mostly, traditional data center design is suitable for organizations that have petabytes of data spread across numerous applications. The model, however, is subject to management challenges for initiatives of rationalizing costs or undertake a refresh cycle. Contrastingly, converged infrastructure vendors offer branded and supported products. The design involves all components, including servers, storage, software, and switches to be placed natively on a qualified hardware appliance. On the flip side, high cost factor of converged infrastructure is limiting the growth of converged infrastructure market. Converged infrastructure built on a proprietary licensed platform can have considerably costly licensing to build. Nevertheless, cost advantages of converged infrastructure is leading organizations to remodel their data center strategy and adopt cloud based services. This serves to boost the converged infrastructure market.